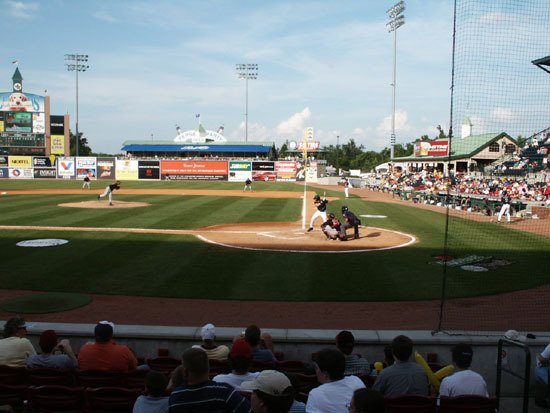 The Lexington Legends, a Single A affiliate of Houston, play at Applebee's Park which was built in 2001, with seating for 6,994. 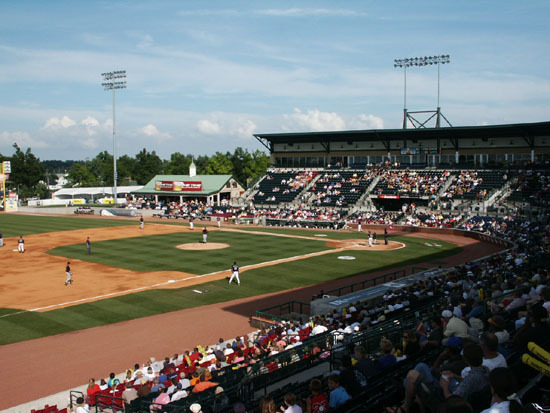 The stadium was privately financed without any municipal or state assistance. 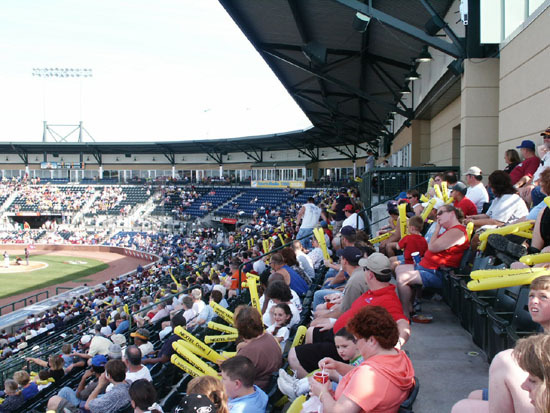 This stadium has the seating above the concession area. 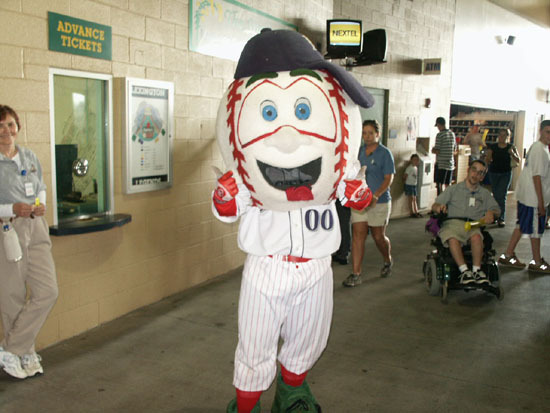 There are TVs in the concession concourse area, so you don't miss any of the game while you are getting your treats. There are seats with cupholders throughout the stadium area. 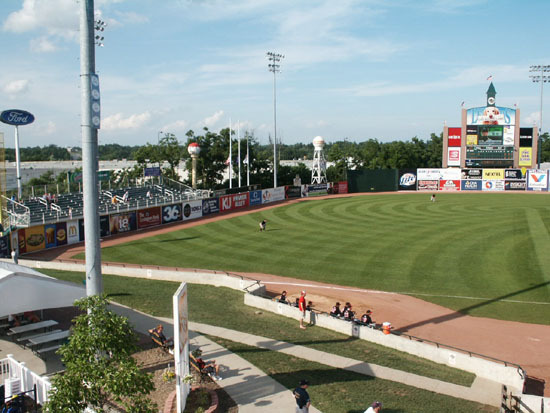 There are two lawn areas; on the 1st base side is a lawn chair area and on the 3rd base side is lawn seating. 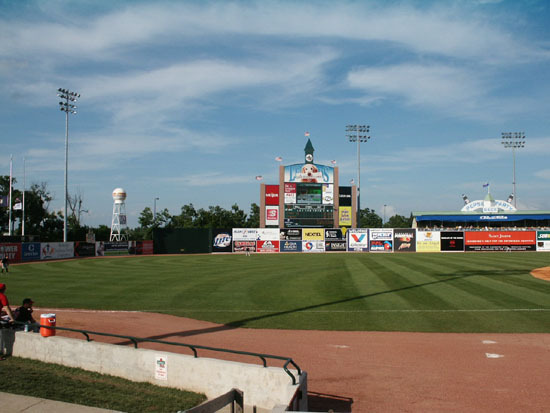 On the 1st base side is the Budweiser Stables area for private parties that has its own seating area. In right field is another private party area, the Pepsi Party Deck. 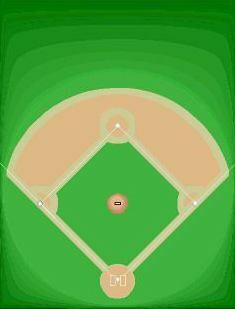 In left field is a section of bleachers without backs. The suites have their own seating area and are behind the regular seating. 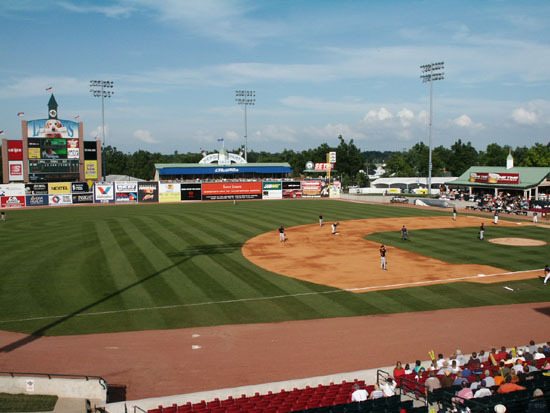 The Legends were playing the Charleston VA River Cats and defeated them 8-2. 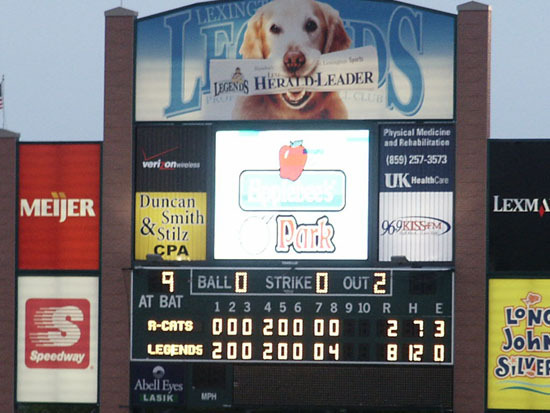 The box score was River Cats R-2, H-7, E-3 and Legends R-8, H-12, E-0. The field lines are RF-318', CF-401', and LF-320'. 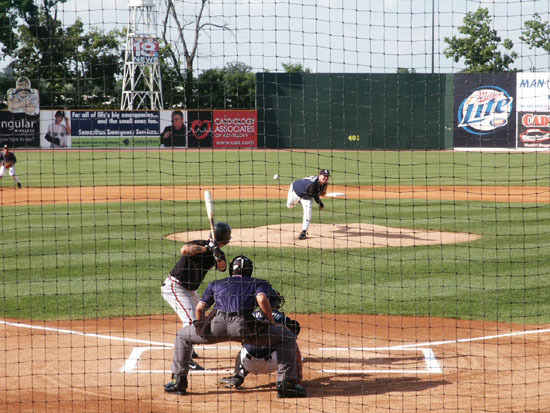 There is a good video system for the scoreboard and a pitch speed indicator. 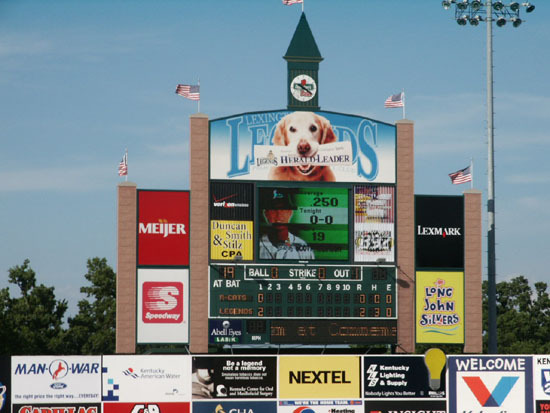 There is a K (strikeout) scoreboard with game Ks and season Ks in left field. 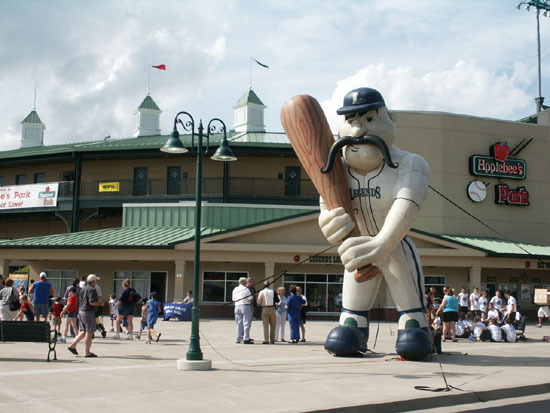 The mascots are Big L with the mustache and PeeWee with the ball head. The Mac Attack crew helps out with the between inning activities and getting the crowd involved with the game. They auditioned 3 children to be the field announcer for 1/2 inning. 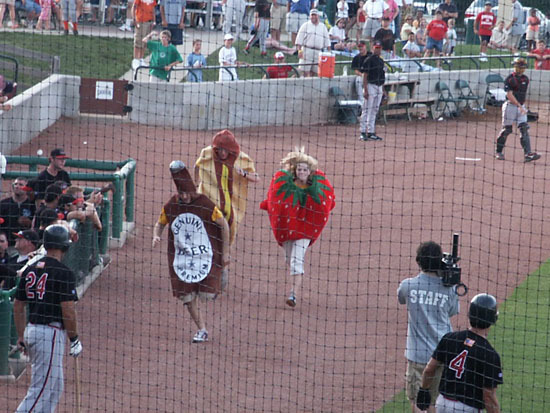 They had a race between a strawberry, banana, hot dog, and bottle of beer from 3rd to 1st. The strawberry won tonight. 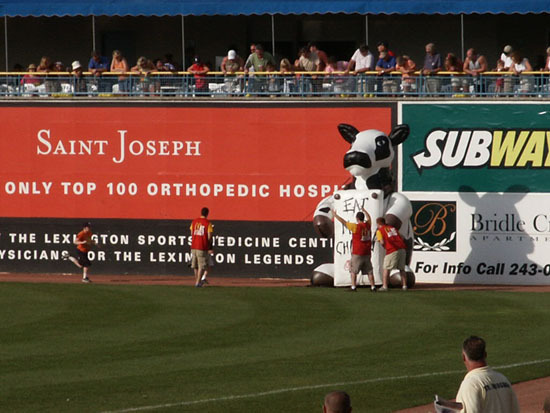 Chick-Fil-A (a restaurant) sponsors a race from the left field corner of the warning track to the Cow in the right field corner. 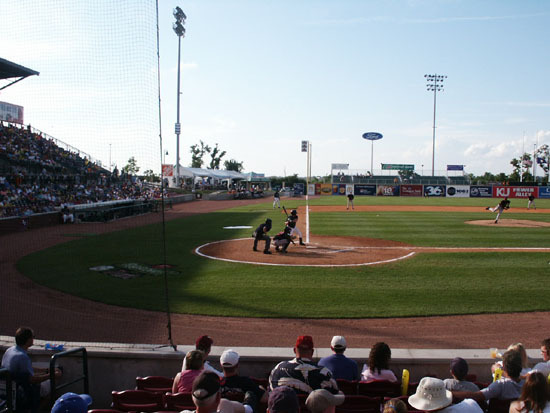 In left center beyond the fence is a very large bat with a baseball on top of the handle. 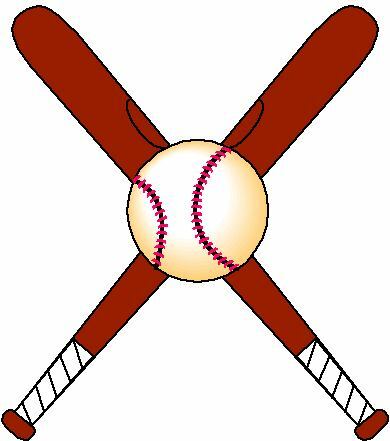 The baseball has red sealing wax dripping down the sides. This bat/ball is sponsored by Maker's Mark Distillery whose bottles are sealed with red sealing wax. 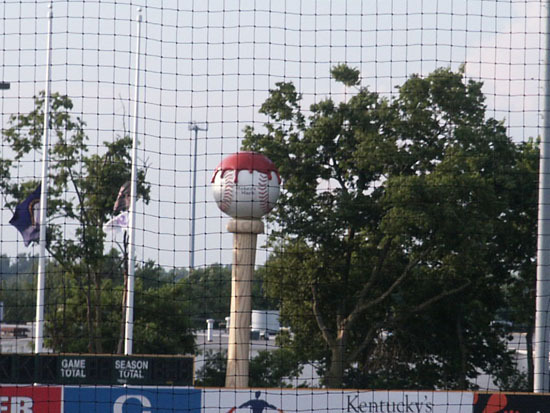 If the ball is hit by a home run $100,000 will be donated to charity by Maker's Mark. 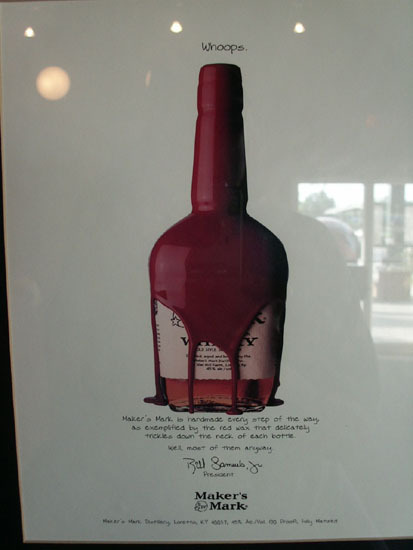 There is a Maker's Mark Club under the stadium for season ticket holders and selected others. This is a restaurant with a nice menu, most items are under $10. 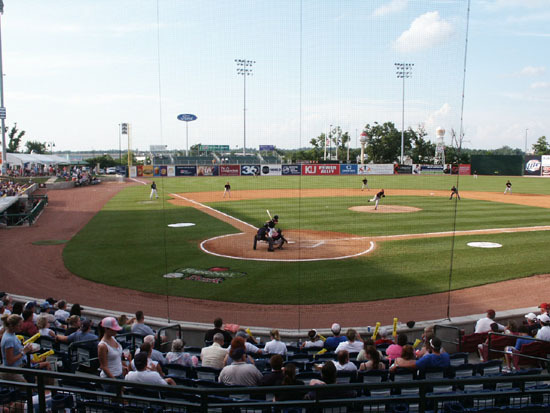 Attendance was 6,149. There is a good selection of food at the concessions with several items just for the children. We would like to thank Missy Carl, Box Office Manager, for providing us with some great seats and passes to the Maker's Mark Club. 2013 new logo. 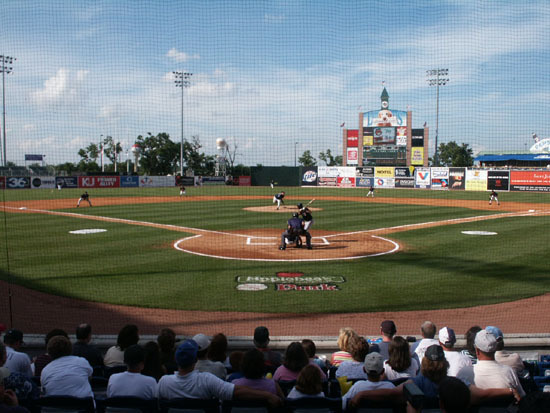 2014 Whitaker Bank Ballpark. Blue Grass Tours is a guided scenic tour of the bluegrass area with stops at a horse farm, Keeneland Race course, Man o' War's gravesite and a drive through historic downtown Lexington. Fee. Kentucky Horse Park is a 1,032-acre facility devoted to the region's equine heritage. Depending on time of year-Fee. Mary Todd Lincoln House as an inn was purchased in 1832 by her father and renovated for use by the family. The building has been restored and furnished in period. Fee.